While we wait for Apple to report its holiday quarter earnings, Consumer Intelligence Research Partners (CIRP) has looked into how the market reacted to the release of the iPad Air and the Retina iPad mini. And the numbers are impressive, even though they were available only for two months. According to their findings, the iPad Air is off to a strong start, accounting for 41% of all iPad sales. This number compares well to the iPad 4, which had about 43% of all sales a year prior. During the holiday quarter this year, only 13% of consumers opted for the iPad 4. The iPad mini and the Retina iPad mini together grabbed another 41% of all tablet sales. Broken down by models, the CIRP study found that the Retina version was the choice of 16% of iPad mini buyers, while the lower-cost iPad mini 1 accounted for 25% of sales, down from the 30% reported in Q4 2012. 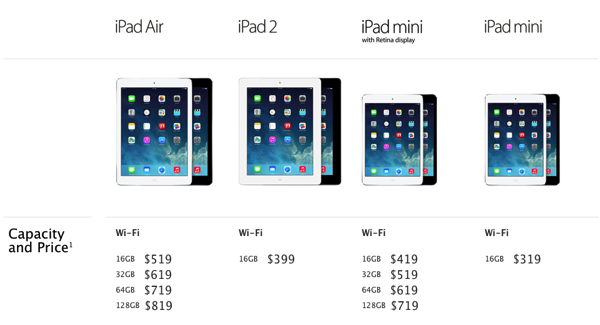 The iPad Air and the iPad mini with Retina display together grabbed 57% of all iPad sales, although Apple has two other lower-cost iPad models for sale.